Sila Thoranam, a naturally formed arch of rock is a distinctive geological wonder located about 1 km north of the Sri Venkateswara Temple, near the Chakra Teertham at Tirumala. 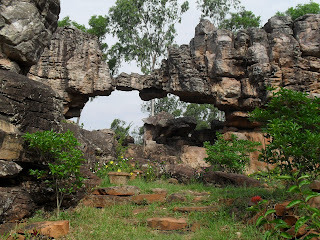 The Arch is also called Silathoranam in local language (Telugu language: “Sila” means ‘rock’ and “thoranam” means a garland strung over a threshold, connecting two vertical columns or an ‘arch’ as in this case). Since the rock look likes and appears to be the hood of a serpent, a conch and a discus, it is conceived that this source is dedicated to Lord Venkateshwara idol. The arch measures 8 m (26.2 ft) in width and 3 m (9.8 ft) in height, and the Geologists have identified the rocks on the hill as pre-Cambrian, and this arch formation suggests an antiquity of several million years to the Tirumala hill. Reputed as the only one of its kind in Asia, it is believed to be several million years old. It is said that there are only two other sites like this in the entire world itself. The other two are the one that cuts through the headland of the Dalradian Quartzite in Ukand and the Rainbow Arch Bridge of Utah in USA . According to one version, the arch resembles the hood of a serpent, a Conch (Shank) and a discus (Chakra) –all symbols of worship in Hindu religion- and considered to be the source of the Idol of Lord Venkateswara at the Tirumala hill temple. The second version is that the main deity in the Tirumala temple is of the same height as the height of the arch. The third version is that Lord Venkateswara is supposed to have put his first foot down at a place called Padalu or Srivari padalu (divine foot prints) which is the highest point of Tirumala hills, the second step at the location of the arch. Thereafter, the next step is stated to have been placed where his idol is now worshipped in the temple at Tirumala. In the 1980s, during excavations for a geological fault in the Tirumala hills, geologists found this rare geological formation of the rock arch which has two dissimilar sets of rocks with a connecting thin link. The assessed geological age of the rock arch is 1.5 billion years. Formation of the arch is attributed to intensified weathering and erosion of stream action that has withstood the torque of nature. This is a rare geological fault which is technically called in the geological idiom as ‘eparchian unconformity’. The Arch is located close to Varahaswamy temple in B1 block and is one km from North of the main shrine of Lord Venkateshwara. The best way to go to Silathoranam is to hire a taxi at Tirumala. Or a 30 minute walk from the Varahaswamy temple in Tirumala would be a pleasant experience.